Our near annual European football trip took place this March (17th - 19th). We journeyed out of that there London early morning on Friday 17 March on the Eurostar to Belgium (Brussels) followed by an ICE train to Germany (Cologne). 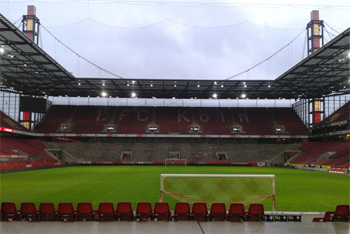 We were based in Cologne for the long weekend taking in FC Köln on the Saturday after watching Borussia Dortmund on the Friday eve. The weather was cold and grey throughout but the rain was restricted to overnight Friday and then again Saturday afternoon until early Sunday morning. This didn't dampen our spirits. Train from Cologne to Dortmund throughout the Friday afternoon rush hour wasn't pleasant, it was rammed during the 75 mins or so journey stopping at Bochum, Essen and Dusseldorf and elsewhere en route. 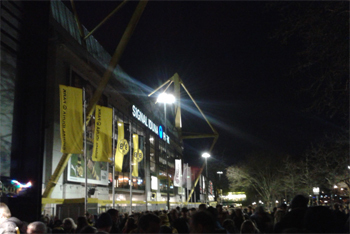 Despite being delayed we had a fair amount of time to follow the hordes to the cracking Westfalenstadion stadium, and joined over 81,000 fans who saw Borussia Dortmund stumble to a 1-0 win over Ingolstadt in the Bundesliga. As witnessed a few years ago the atmosphere was electric, but we were let down by the standard of the footy on this occasion. The opposition wasted many chances and a stronger team could have easily embarrassed 3rd placed BVB, who had to rely on a well worked early strike to take the points. Back at about 2am in Cologne, as more delays were experienced on the train. The twin-towered cathedral in Cologne is the city's centre of attention and we had a look around this striking place on Saturday morning before having a pre-match beer (Kölsch - don't think the locals serve owt else!) in one of the excellent Brauhauses. The heavens opened on leaving the tram at Cologne's RheinEnergieStadion but we were soon inside for the 3.30 pm kick off. A much better match than the previous evening with FC Köln taking a deserved 3-0 half time lead over Hertha Berlin. The visitors raced out of the blocks in the second half pulling one goal back, and should have had a second, but FC Köln broke away for a clinching fourth goal only for Hertha to once again pull one back. The match finished 4-2 and 6th placed FC Köln closed the gap in the Bundesliga on their​ 5th placed​ opponents. Sunday morning allowed for a walk along the Rhine and a bit of birding. A couple of singing Short-toed Treecreepers were noted as were a pair of Peregrines over the city centre. The Tiercel wanted to display but the Falcon thought otherwise. Several gulls on the Rhine included a couple each of Herring and Yellow-leggeds. A Ring-necked Parakeet was a surprise flyby back near the hotel.